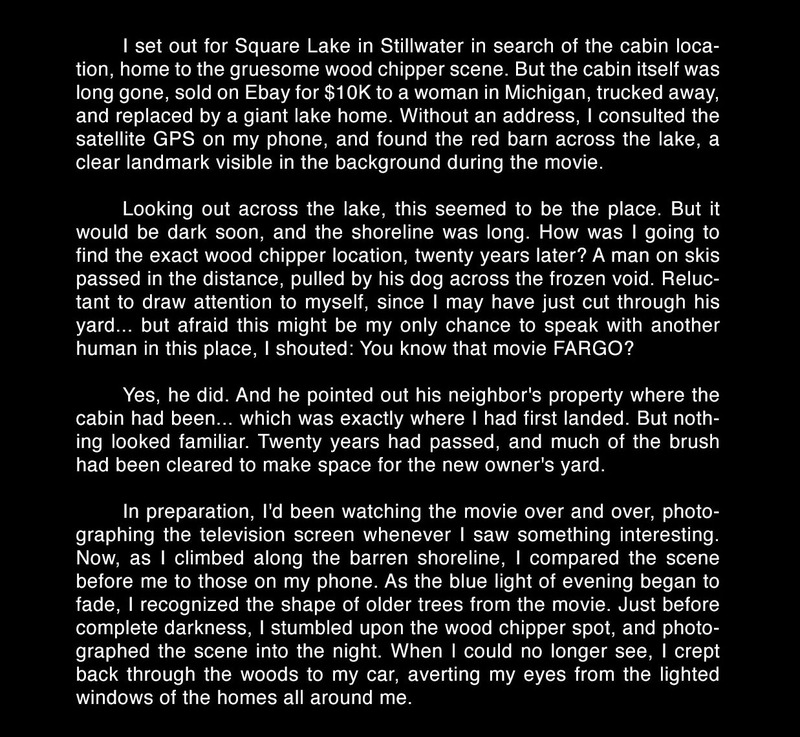 I set out for Square Lake in Stillwater in search of the cabin location, home to the gruesome wood chipper scene. But the cabin itself was long gone, sold on Ebay for $10K to a woman in Michigan, trucked away, and replaced by a giant lake home. Without an address, I consulted the satellite GPS on my phone, and found the red barn across the lake, a clear landmark visible in the background during the movie. Looking out across the lake, this seemed to be the place. But it would be dark soon, and the shoreline was long. How was I going to find the exact wood chipper location, twenty years later? A man on skis passed in the distance, pulled by his dog across the frozen void. Reluctant to draw attention to myself, since I may have just cut through his yard... but afraid this might be my only chance to speak with another human in this place, I shouted: You know that movie FARGO? Yes, he did. And he pointed out his neighbor's property where the cabin had been... which was exactly where I had first landed. But nothing looked familiar. Twenty years had passed, and much of the brush had been cleared to make space for the new owner's yard. In preparation, I'd been watching the movie over and over, photographing the television screen whenever I saw something interesting. Now, as I climbed along the barren shoreline, I compared the scene before me to those on my phone. As the blue light of evening began to fade, I recognized the shape of older trees from the movie. Just before complete darkness, I stumbled upon the wood chipper spot, and photographed the scene into the night. When I could no longer see, I crept back through the woods to my car, averting my eyes from the lighted windows of the homes all around me.